It is now mid-August and both Philadelphia Union and Bethlehem Steel FC are red hot. Yes, you read that correctly. Both. We all know the Union are deep in a Lamar Hunt U.S. Open Cup run as they reached their third final in four years. Now, with Saturday’s road win in New England, Union are well positioned for a playoff run, too. Like the younger sibling in a family, Bethlehem often get overshadowed as most of the attention is fixated on big brother in Philly, but make no mistake. Bethlehem Steel are putting together a nice run of results for themselves. 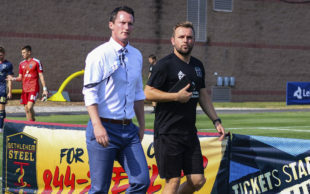 Before this past Sunday’s loss to in-state foe Pittsburgh Riverhounds, the boys in blue strung together three consecutive wins–their longest streak of the season and longest since June of 2017. With nine vital points taken from three matches, the Steel leaped three spots and now find themselves positioned in seventh place. Firmly in the Eastern Conference playoff picture. Who gets credit for the newly found success? Bethlehem’s own are winning. Not just winning, but dominating the opposition. So who exactly deserves the credit for this recent run? Bethlehem’s style of play requires a certain level of commitment of its players. Every single player that steps on the pitch has a role, a duty to learn the tactics set by coach Brendan Burke and to give everything for the crest on their shirt. Burke has implemented a high pressure, quick tempo system in the Lehigh Valley. It is a system in which each player plays a vital role. No player can take five minutes of play off to catch their breath. Commitment to the formation and tactics is the key to this team’s success, and it is the leadership shown by the veterans that make the difference. When James Chambers was made captain of the club, it was not awarded on talent but rather on merit and his willingness to lead by example. No player better understands his role at the club better than the Irish midfielder. What he may lack in talent is more than made up for in his physicality and ability to dictate the tempo of a match. James Chambers typifies everything Bethlehem Steel FC are about. No big name stars–just hard nosed, gritty, and determined players committed to a role. There are certain teams in the USL that are able to get through a season being carried by a few superstars. Bethlehem simply do not have that luxury. No player on this team has the ability to take control of matches from week to week. Any success from the Steel will come through a collective effort and goals can come from anywhere–even from some unfamiliar names. In those three prior matches this past month, the Steel have outscored opponents by a staggering ten goals to one. When a team scores 10 goals in three matches it is typically on the back of a few incredible individual performances from one of the team’s strikers. That has not been the case over the past month. Nine different goal scorers have contributed to the ten goals, which exemplifies the team first nature of this Steel squad. Anyone can play hero on any given match day. With the days of having star goal scorer like Cory Burke far in the rearview mirror, coach Brendan Burke has needed others to step up and fill the void left by the Jamaican target man. No player has notched more than Fabian Herbers and his five goals on the season, but the truly impressive stat is that 20 (yes, 20) different players have gotten themselves on the scoresheet this season. Most teams barely field twenty players throughout the course of the season let alone have that many score for the club. It’s truly refreshing to see a team with this kind of cohesion in an era of international superstars across world football and even here in the United States. If Bethlehem is to make any kind of playoff run this year, don’t count on any one player. Not trying to hate, just dropping info. Fully aware. Not trying to convince you that they are a good team (because they’re not), but they are a good ‘team’ and that is worth something in sports.